The accommodation is well served by good train connections from Rome, Pisa, Milan, Bologna or Florence. Also by car, using the highway, you can get to Terontola quickly. You cannot hear the highway from Landrucci. At most you can hear some farmers at work there. Landrucci is 1.5 km from railway station Terontola and from there many historical cities like Florence, Assisi, Perugia and Rome are in easy reach (and cheaply!).. There are many trains from all over Europe to Italy. The price depends on the departure dates on which country you travel and whether you have a discount card. For example the price for a return Netherlands - Terontola is from 149 euros. From The Netherlands, for the cheapest tickets and information: www.treinreiswinkel.nl. In general: The earlier you book the cheaper it is. For those arriving by train (no flights in between) the transfer from the station to Landrucci will be free of charge. Additionally, comfortable tour bicycles and tour maps will be available for free. Flight prices change continuously. Flights from your local airport to Florence, Pisa or Rome are recommended. In case you have to stay overnight in one of these places, then Lucia Tours provides travellers with free information on booking a cheap lodging place. Florence is a small airport with a direct bus to the station every half hour. 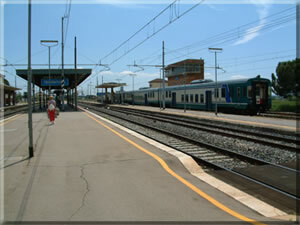 From Pisa Aeroport and from Verona / Bologna there are frequent trains via Florence to Terontola. From Rome airport there is a train or bus to the centre of Rome and from there (Termini station) trains depart regularly to Terontola. Airport Pisa – Florence (Firenze): approx. 1.5 hours. Verona / Bologna - Firenze: approx. 3 hours. Florence (SM Novella) - Terontola: 1 to 1.5 hours. Firenze - Terontola; ± 7 euros. Pisa Aeroport - Terontola; ± 12 euros. The Terontola station is approx 1.5 km from Landrucci. Near Terontola are several bars and two restaurants. There are several supermarkets, many shops and banks. The shops are open from 16.30 (or 17.00) to 19.30. In the “Sala" of Landrucci is a little shop with water, pasta, coffee, tea, beer, milk and other basic supplies. The homemade products such as olive oil, various fruit juices, jams, wine, honey, eggs, etc. are organic products. This little shop is always open. By phone +441425 617480 or email rinus@luciatours.nl. For Burciano: +3170 3646012 (NL). After booking you will receive a confirmation with the invoice, other information and a further description of the train or car journey to Landrucci.